Why do governments tolerate the violation of their own laws and regulations? Conventional wisdom is that governments cannot enforce their laws. Forbearance as Redistribution challenges the standard interpretation by showing that politicians choose not to enforce laws to distribute resources and win elections. Alisha Holland demonstrates that this forbearance towards activities such as squatting and street vending is a powerful strategy for attracting the electoral support of poor voters. In many developing countries, state social programs are small or poorly targeted and thus do not offer politicians an effective means to mobilize the poor. In contrast, forbearance constitutes an informal welfare policy around which Holland argues much of urban politics turns. 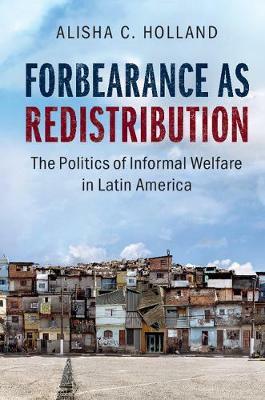 While forbearance offers social support to those failed by their governments, it also perpetuates the same exclusionary welfare policies from which it grows.